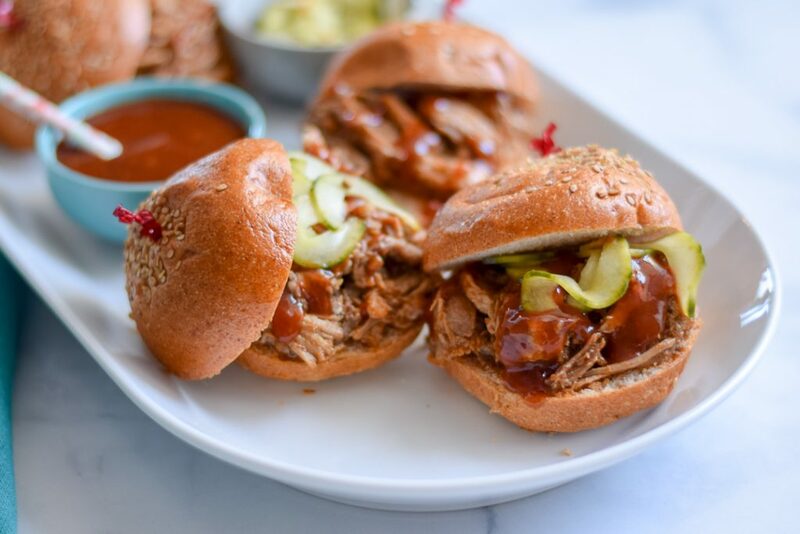 Homemade barbeque sauce and spicy quick pickles take these Instant Pot Pulled Pork Sandwiches to the next level. Perfect for your next party or for your family meal plan. Pulled pork is one of those foods that I love so much, I only let myself make it 1 or 2 times per year. Luckily, since I am usually cooking for two, one batch of pulled pork will last a while. It is very versatile, and goes with just about anything. Scrambled eggs? Top with pulled pork! Have a sweet potato? Leftover macaroni and cheese? Roasted root vegetables? All improved by some pulled pork. The first time I made pulled pork, it was an all-day affair. And if I’m being honest, it didn’t turn out that great. Despite slow cooking all day, it was tough to shred and the meat was a little dry. Though later attempts were much improved, it still didn’t have the same flavor or texture that I experienced in restaurants. Then, the Instant Pot came along. 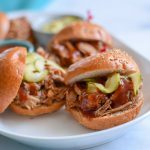 Not only does the Instant Pot make perfect pulled pork every time, it also makes it very quickly. (Instantly, maybe?!) 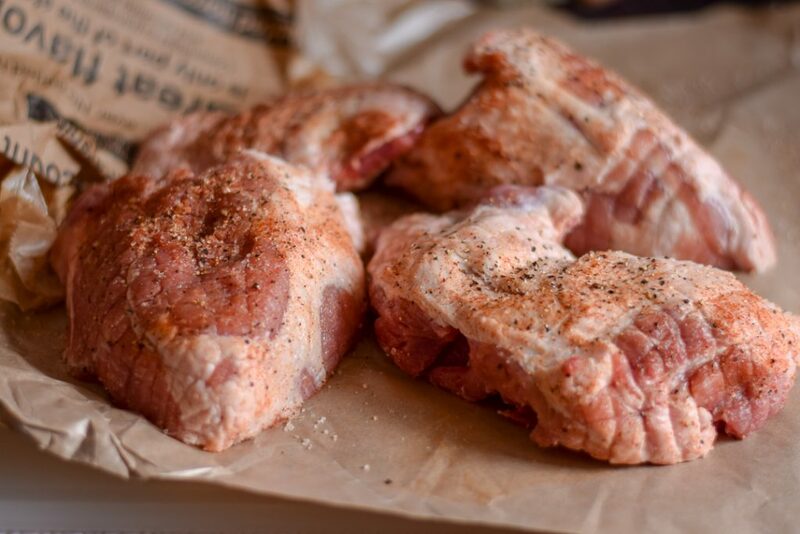 Unlike a slow-cooker, you can sear the pork shoulder to build extra flavor. 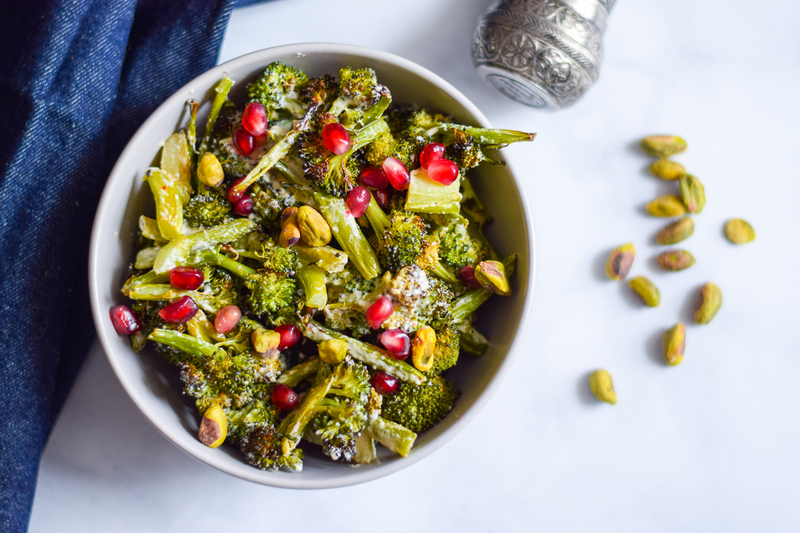 Unlike cooking on the stove or in an oven, this is pretty set-and-forget. You really get the best of both worlds. Though it is one extra step, please please please take the time to sear the pork shoulder before pressure cooking. This helps to build extra flavor as well as adds texture to the final product. For the best sear, use the saute function on “more” or “high” (depending on the model you have) and wait until the screen says “HOT”. Trust me, patience is crucial here. Trying to sear something in a pot that is not hot enough will only lead to heartache. And pork shoulder that sticks to the bottom of the pot. Each region of the US has a different take on barbeque sauce. Some are sweet and smokey, some have a lot of mustard, and some are very acidic, but they all are traditional and true to their region. This barbeque sauce follows none of those rules, but is delicious nonetheless. If you are really in a pinch for time, feel free to use your favorite brand. However, I highly recommend making your own. 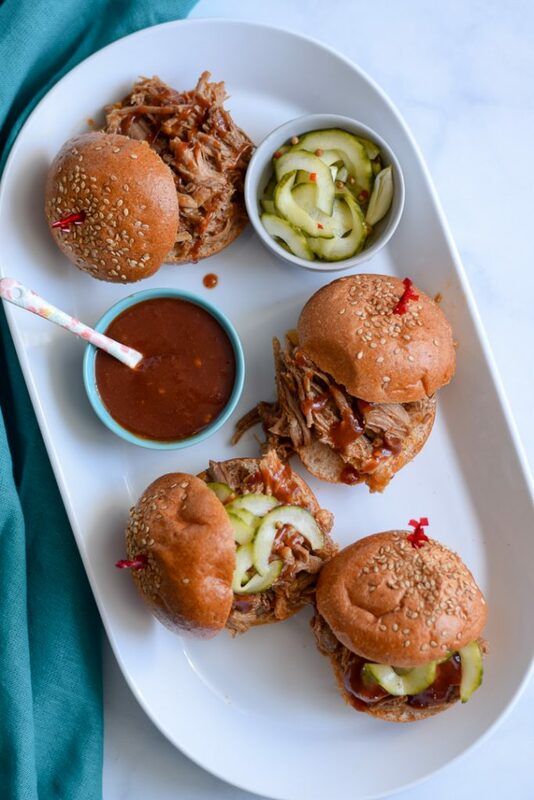 It give you the ultimate flexibility in creating the flavors you want for the pulled pork sliders. In this recipe, half of the barbeque sauce goes in to the Instant Pot with the pork, and the other half is reserved for serving. I like the heat level in this sauce, but if you prefer a more mild spiciness, reduce the chili-garlic sauce or omit entirely. 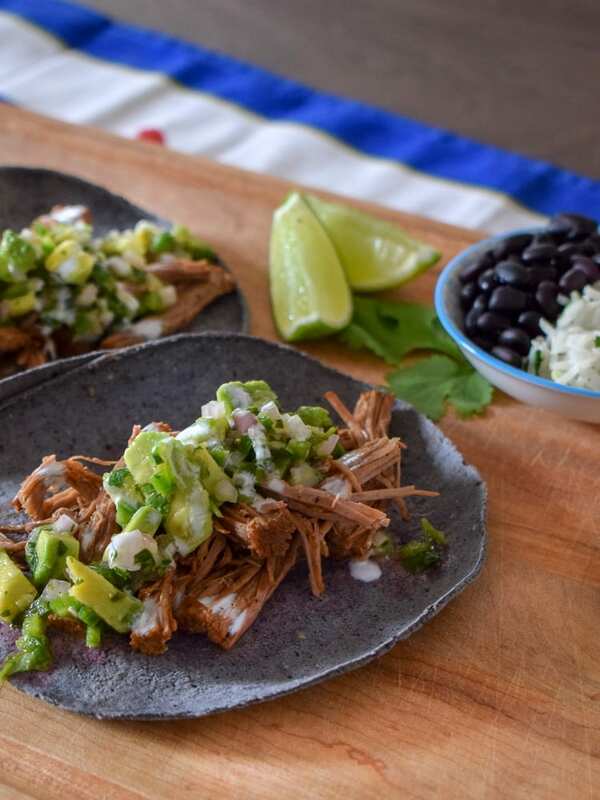 Though making Instant Pot Pulled Pork is faster than traditional slow cooked methods, you still have plenty of time to create some add-ons for some sandwiches. One of my favorite sandwich toppings is the quick pickle. 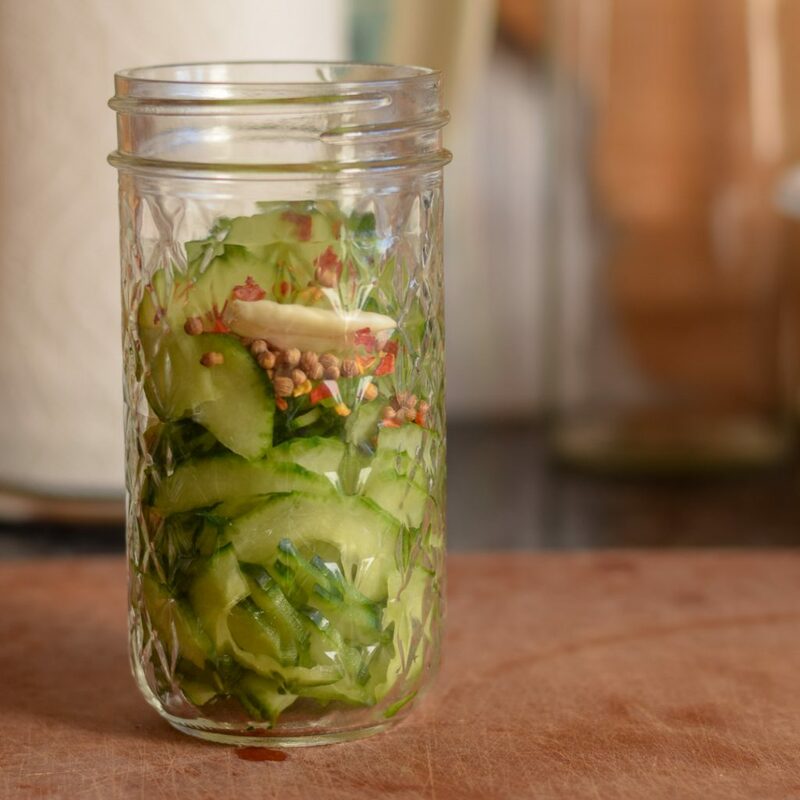 Though your favorite brand of pickles will do in a pinch, consider making your own. With a quick pickle you still get the acidic crunch you know and love, but the cucumber also retains some semblance of being a vegetable. You also get to play with the flavor! I add lots of garlic, red pepper flakes, and coriander seeds to my pickles, but the sky’s the limit here. In a small bowl combine the ketchup, chili garlic sauce, syrup, vinegar, and soy sauce. Stir to combine. Taste and adjust to your preferences! Turn on the “Saute” function of your Instant Pot, and hit the “+” button to turn on high. In a small bowl, combine the salt, pepper, and paprika. Cut the pork shoulder into 3 or 4 equal sized pieces, and season on all sides. When the front of the Instant Pot reads “HOT”, add the canola oil. Sear the pieces of pork on all sides, about 3-4 minutes per side, working in batches if necessary, until the pork is browned on all sides. Remove the pork and set aside. Add the sliced onion, and set the seared pork on top of the onion. Pour half of the prepared barbeque sauce over the pork and place the lid on the Instant Pot, turning the vent to the sealed position. Set the timer for 45 minutes on high pressure using the “Manual” or “Pressure Cook” setting. It will take 10-15 minutes for the pot to come to pressure, then the 45 minute timer will begin. Allow the pressure to release naturally for 15 minutes, then manually release the remaining pressure. Remove from the pot and shred with two forks. 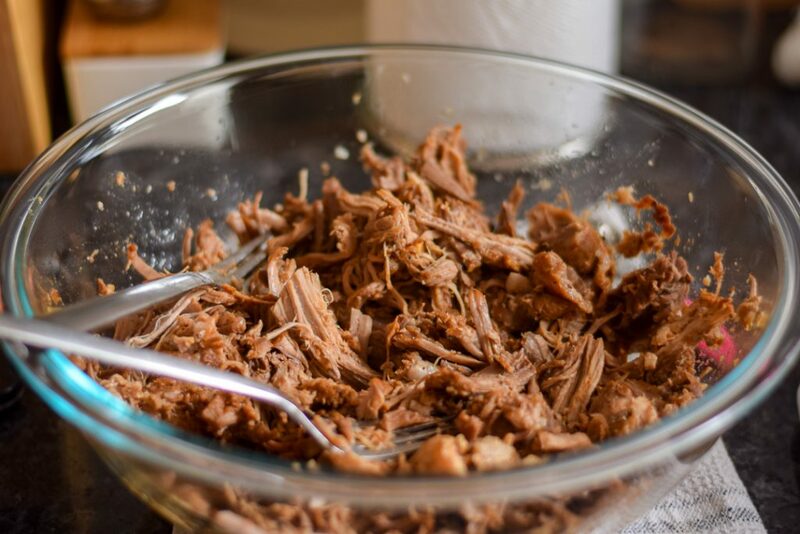 Add ½ – ¾ cup of the cooking liquid to the shredded pork, and discard the rest. While the pork is cooking, make the quick pickles. 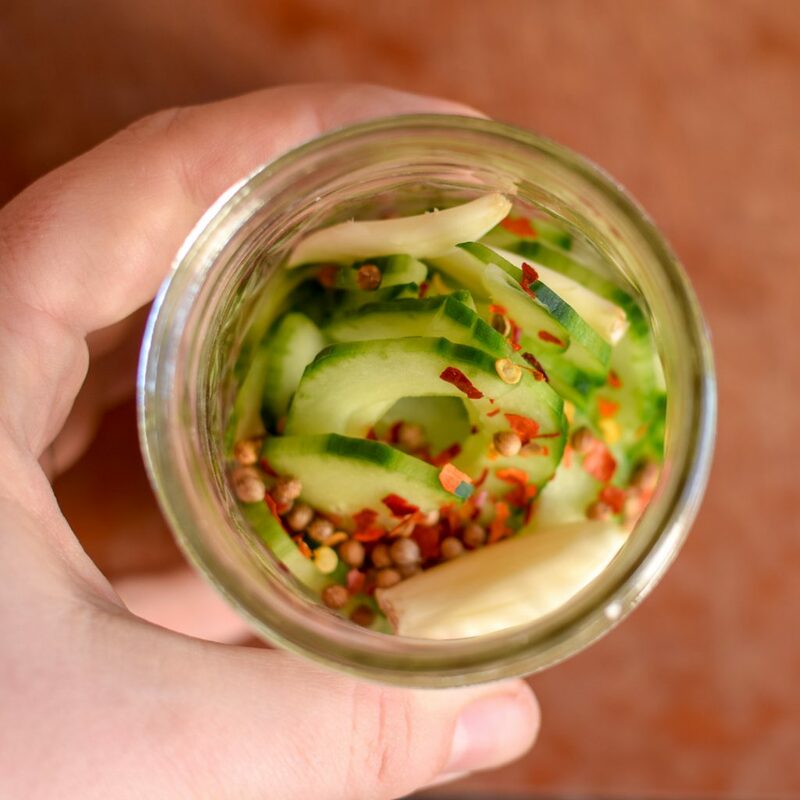 Add the sliced cucumber, garlic, coriander seeds, and red pepper flakes to a jar or other heat-proof container. In a small saucepan, combine the water, vinegar, salt, and sugar. Heat over medium-high heat to a low simmer until the salt and sugar have completely dissolved. Pour the liquid into the jar with the cucumber and spices. Allow to sit for at least 10 minutes, or until you are ready to assemble the sandwiches. Prepare 10 sandwich rolls or 20 slider buns. Place a generous portion on each bun, topping with the reserved barbeque sauce and as many pickles as you like. The quick pickles and sauce can be made in advance! Store in the fridge for up to two weeks. This recipe makes 10 “normal” sandwiches, but can also be used to make sliders as pictured.